Evening Primrose in all their glory! Evening Primrose is a magnificent gift from God. The whole plant is edible and medicinal. This is one of those prime examples of “Letting food be your medicine and medicine be your food”. I have a deep love for this cheery plant and it is EVERYWHERE where I live. Especially on my acre cause I’ve collected seed heads and spread them far and wide. Can’t get enough of it’s vibrant joy! 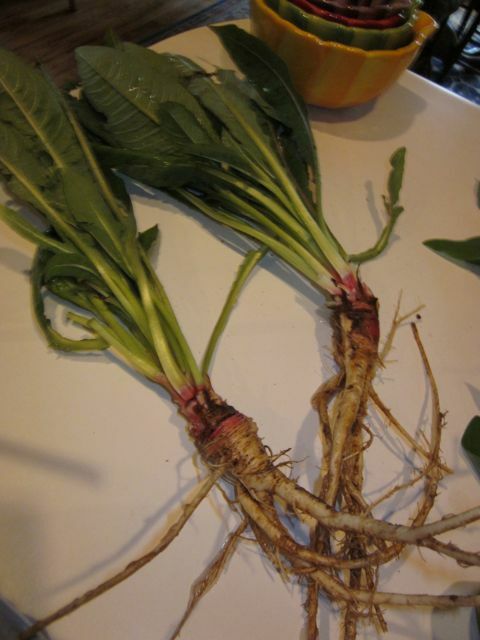 Root: Spring Roots taste rather parsnippy and peppery. Roots can be dug in the Winter (according to Linda, I’ve never tried it) First year plant root is optimal, it dies after the second year. Flower: harvest in full bloom right before use. 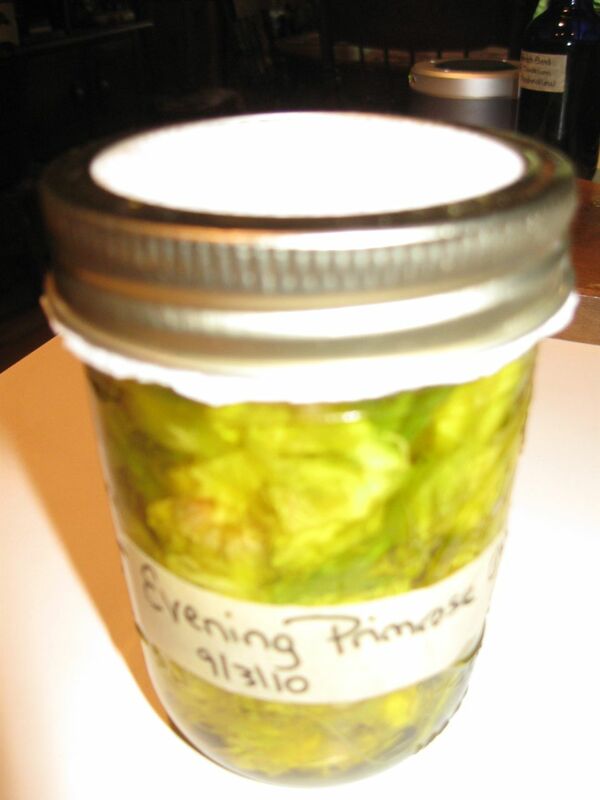 Use to decorate salads, cream cheese… Can keep a flower stalk in a vase of water and pick the flowers as they bloom to use in cooking or in an infused oil. 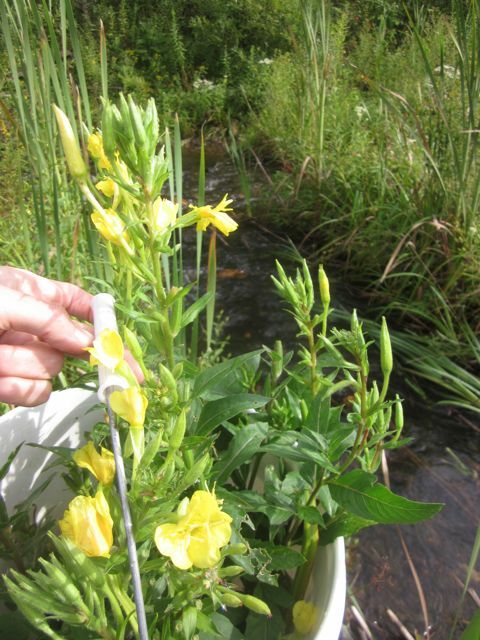 Evening Primrose is often found in gravelly dry soil, along roadsides and in waste areas. Cultivation tips: Biennis in the name indicates that it is a biennial plant that grows for only two years. Spread the seeds sown directly in the soil outdoors in mid-spring. EVP seeds require light to germinate require light to germinate so scatter them on the soil’s surface, tamp gently and bottom water. Space plants 8-12 inches apart. Likes full sun but will tolerate part shade. Reseeds EASILY. The young leaves pop up early in the Spring and are a prime indicator that a tasty root is there waiting to be prized. 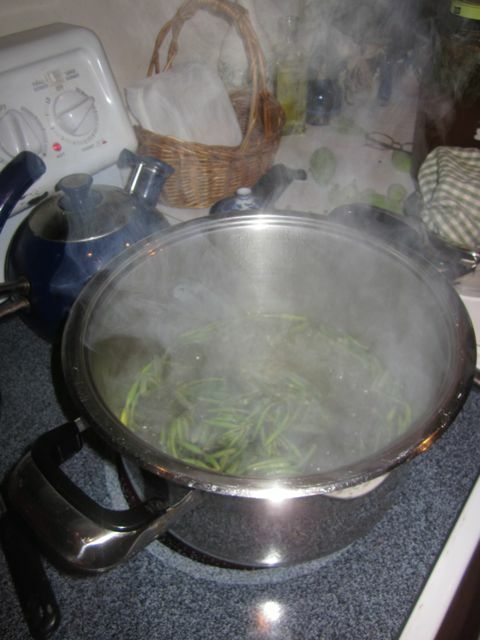 I collected many first year plant roots in the Spring and dried them to reconstitute later in soups and stews. I like eating the root with carrots and parsnips. The young leaves are tasty as well, I prefer them boiled or stir fried to raw though. 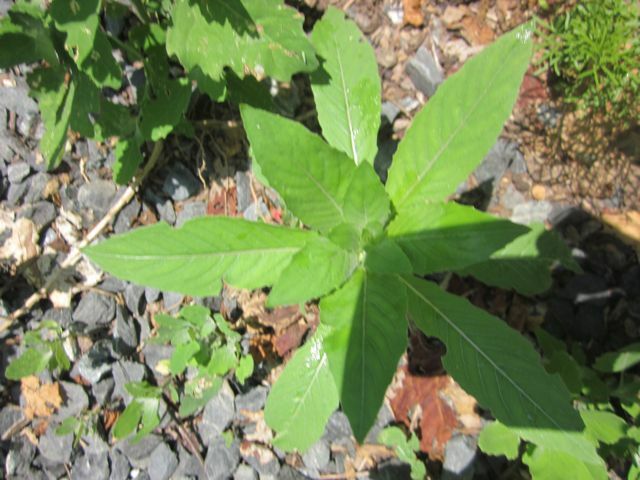 Young leaves can be eaten as a vegetable or in salads. Dried or frozen to store. Buds are edible before flowering. Collect the tiny black seeds from the seed pods in the fall and use them as a GLA supplement by grinding and storing in another EFA type oil (fish, flax etc). Or storing whole (preferably cool) and grinding as needed on a daily basis and adding the seed meal to foods; smoothies, hot cereal, fruit salads, nut butter etc. Roots may be eaten raw or cooked. Dry for long term storage. Decorate salads with the flowers which taste jasminy and delicious. 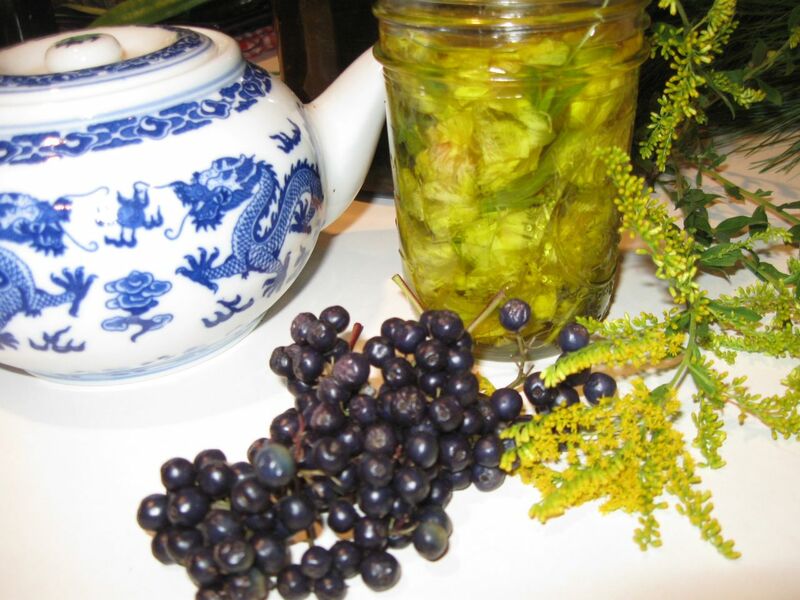 Make an herbal infused honey with the EVP flowers and chopped up fruits. 1.Linda Runyon says “Rumor has it that oil from this delectable wild flower is one of the most expensive, as well as most beneficial for humans. 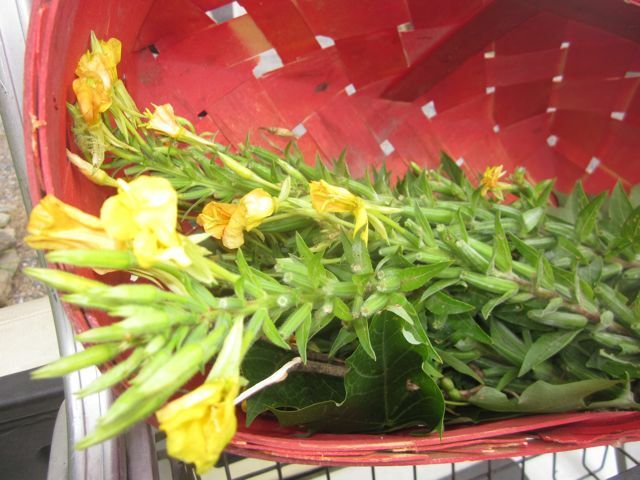 It’s composition close to the constituents of mother’s milk, evening primrose offers many medicinal remedies”. Secondly, EVP seeds, are also a good source of the amino acid tryptophan, which the body converts into the mood-improving brain chemical serotonin. and thirdly, the plant’s leaves are our best source of the bioflavanoid quercetin, which keeps blood vessels healthy, improves circulation, and eases asthma. 4. The opening of Evening Primrose flowers is a magical site. Some say they all open at around 8:45 each night. Would be worth watching this happen. 5. The Ojibwas used the whole plant, soaked in warm water, to make a poultice to heal bruises. 9. I like using the infused oil in salad dressings or as one of the oils I use when creating herbal lotions and creams for cosmetic use. 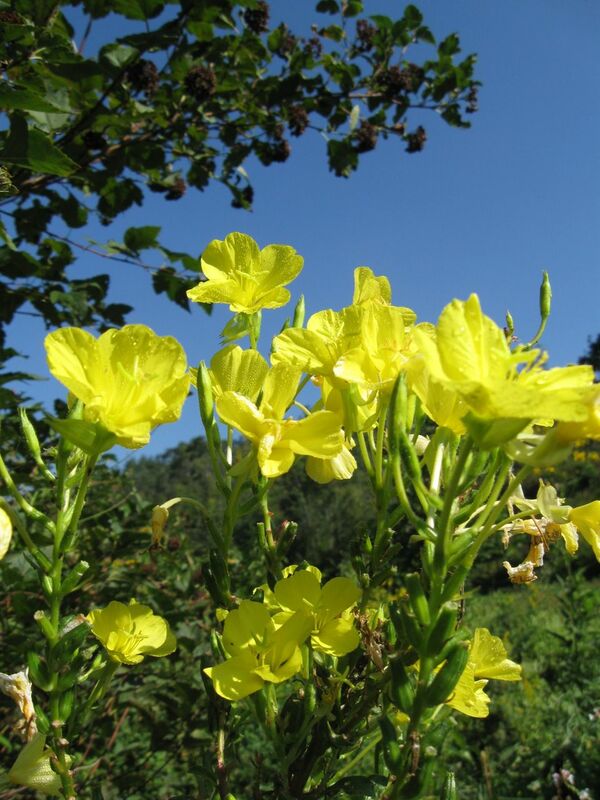 Next I went to an island park here in Todd, where the Evening Primrose stalks were heavy with yellow flowers, I collected several cups of these beauties to make Evening Primrose oil with for salad dressings. Carrion berries were out in abundance but I don’t know anything about their edibility, just their beauty. Anyone know? Then onto the llama farm, where the Peppermint and Hops were joyfully collected for a Winters store. I stuck the Cattail seed stalks in the marshy earth near streams and nearby ponds in hopes that they will multiply their bounty closer to my home. All the gifts are garbled, hanging to dry, tincturing in Scotch whiskey or vinegar, or packed in oil. A good feeling after a day of adventure and shopping in the wild. 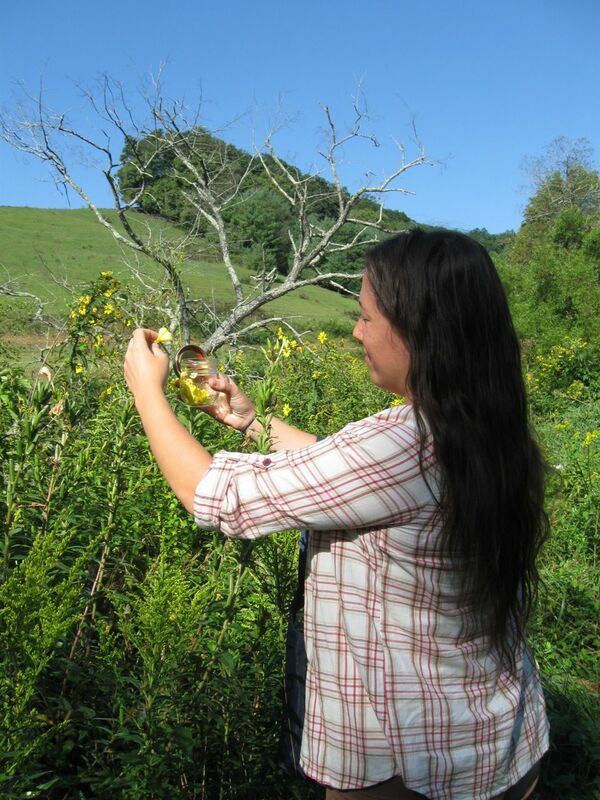 Oh and the Goldenrod is prime for the pickin! Evening Primrose an amazingly versatile herb. Incredibly nourishing, gentle and very effective, I count it as among my most important herbal allies! I’m writing a piece on it (and it’s close relative Gaura) for the Medical Herbalism Journal shortly, and will do more updates to my monograph then. Nervine – relaxing and grounding and uplifting all at once in a gentle way. Anti-spasmodic – Great for uterine and other repro. cramping. Endocrine tonic – Don’t know exactly how it works but it does seem to have some overall nourishing and calming/relaxing effect on the repro and endocrine system. First Aid- Great externally as liniment, salve or poultice for all kinds of cuts, scratches, bug bites/stings and so on. Gut soother – Improves and stimulates digestion while cooling and healing the gut, works REALLY nicely with Plantain and/or Chamomile for all kinds of gut inflammation and pain. Note the EP oil is a commercially extracted oil made with the seeds. You can make something similar yourself with the seeds but it won’t be as concentrated. 1 Tbsp evening primrose petals 6 evening primrose flowers, whole, with green bits removed. 1 stalk celery, scrubbed, stringed and cut crosswise into 1/8 inch slices. 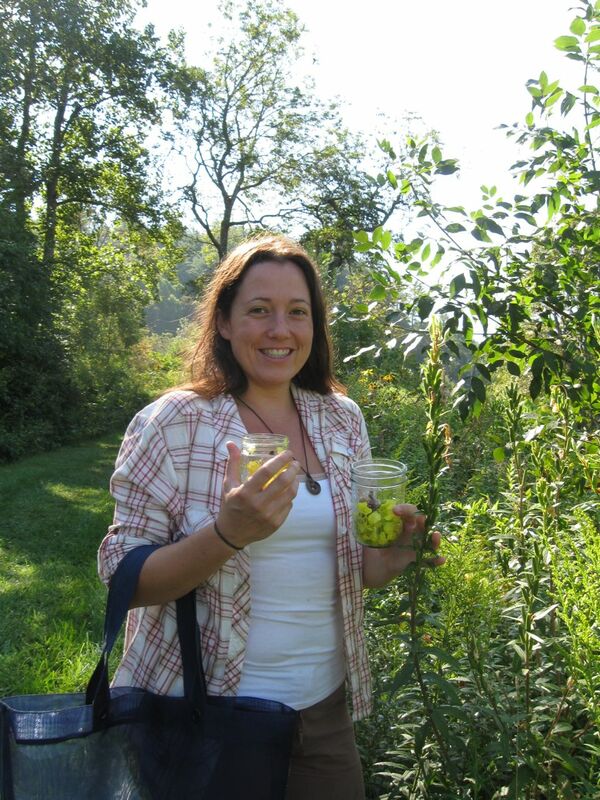 Holly, I just love your website and and all of this info on Evening Primrose. I’ve just recently discovered how great it is. I had a pituitary tumor (prolactinoma),after coming off birth control, that caused me not to ovulate correctly and lead to a host of other endocrine problems. Most of it resolved after I finally got pregnant and breast-fed for 16mos.. But I was still having a little trouble with dryness and not sweating. I hadn’t had to wear deoderatnt for years. I heard Rosalee de la Foret, on Herb Mentor talk about it being helpful for adding moisture to mucous membranes so I got some Evening Primrose oil. I was amazed at how well it worked(within 2-3 weeks) and not only did it help with moisture but I am now sweating normally too! I have fallen in love with this plant and the more I learn about it the more I love it! Wow Tamra that is a fascinating story. Thanks for sharing. I LOVE this plant too. I’m spreading it’s seeds everywhere to share the wealth. Such a vibrant plant with many mysteries to discover. How cool to hear from you across the globe. Evening Primrose has many species and it is wonderful to think that people everywhere can enjoy it. I’ve been collecting yet more of the EVP seeds to spread the bounty. Thanks for reading my blog! Be blessed today! I just harvested primrose leaves and root for the first time. Can I make an infused oil with these constituents (roots and leaves) that will be effective or does it need to be prepared as an essential oil professionally from the seeds? Thanks for your thoughts. 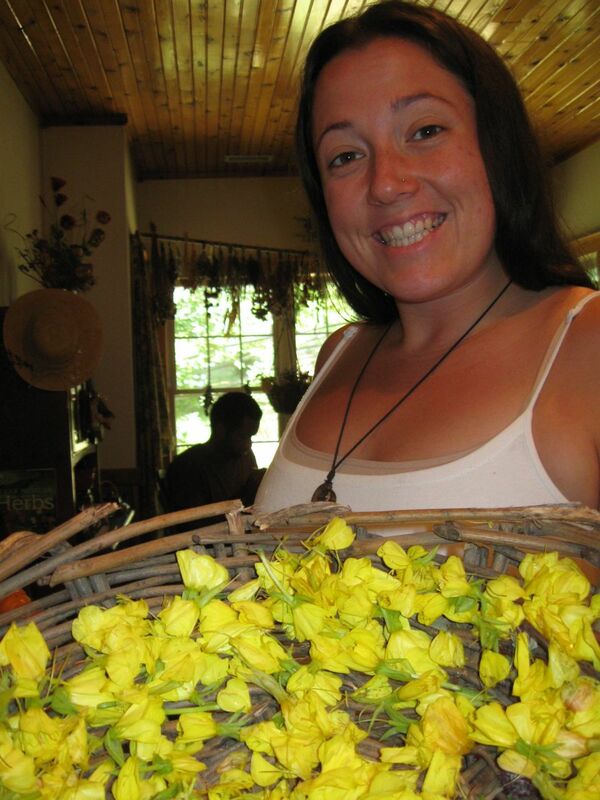 I use the stem of the Evening Primrose that grows at my cabin to make bracelets. The stem gets sort of a bark on it, and when it does I lay it down and gently hit it with a rock to crack the sides. Then I peel the cracking parts off (it should come in very thin, see-through strands) and soak them in water for a few minutes. I take the thin strands and twist them the way a rope is twisted, adding more as the length runs out. It takes a bit of practice and my hands get sore after a while but I’ve been wearing my bracelets for a year now and they have held up. They hold a lot of meaning to me considering how amazing this plant is! Oh I wish you’d send a picture. This sounds so cool! I have Missouri Evening Primrose in my garden and wanted to grow more plants from seeds. My plants have a ‘cylinder-type’ green shape growing with the flowers, which I think contains the seeds. Is that a correct assumption? Any ideas on what I do the ‘harvest’ the seeds and grow seedlings? The seeds will evolve as the plant ages and the seed pods turn brown. When the seed pods are green the seeds are immature. 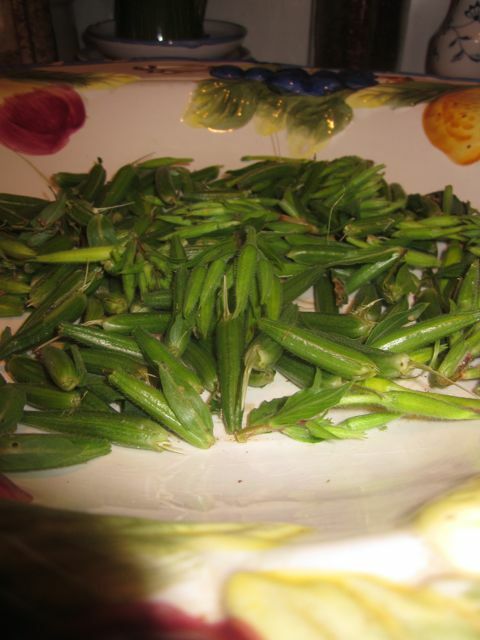 I love to eat the flower buds and the young tender seed pods are delicious when prepared properly.